I would like to take this quick opportunity to wish a very happy birthday to a guy who has become one of my best friends even though we have never, ever met in real life. To a guy who I’ve worked closer with than some of the people I work with day to day. Dude, you’re the best. I ask all of you loyal readers to take this opportunity to wish our favorite Leprechaun a happy birthday. My wish is for you to click the stars above to give it a rating and make a comment for him. Let’s show him how much we wish him a great day! Happy Birthday Pal! And may you have many happy returns! 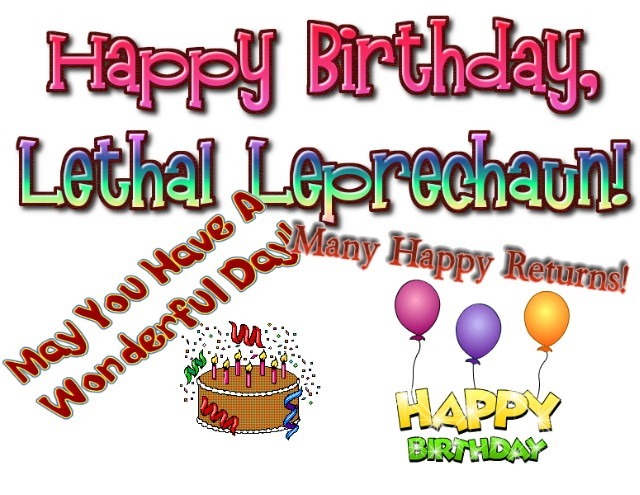 18 Responses to Happy Birthday Lethal Leprechaun! Have a wonderful Day! HAPPY BIRTHDAY!! Happy Birthday Lethal..May you have many many moore!! Happy Birthday Lethal!! I hope you have a great day and enjoy many, many more birthdays!! I’d like to thank Impish for his kinds words- even if I did think we had reached an agreement where he wouldn’t mention my advancing age and in return I wouldn’t mention his advancing waste land I MEAN waist line. I’d also like to take this opportunity to thank my producers, without who none of this would ever have been possible. So thanks Mom & Dad without your biological aid, and the fact that a dwindling supply of American condoms were too far across the cold Irish cottage bedroom and the fire in the stove had gone out long about Christmas 1959 I’d not be here writing this now. In truth I’m looking forward to each new birthday a little less. The speed at which they repeat themselves indeed does seem to be coming more quickly. Unfortunately I can’t say the same of the insight and wisdom its supposed to bring along for the trip. As a result of that realization I’ve gotten into the habit of searching my life every year to determine where I am and where I should be going in the next year. I look every year for a song that sums up my feelings long about my birthday. Some years I’m more successful, than others and some years the lyrics are more profound than others. Deep roots are not reached by the frost.” – J.R.R. Tolkien, The Fellowship of the Ring. I sort of realized that as long as I have Molly, some semblance of health, my few good friends (yes Impish you top the list) then I shouldn’t sweat the rest so much, after you have those things the rest is just biscuits and gravy. Wooo HOOO! Shake dat booty Ginny! When you’re done dancing that jig come lay across me lap and I’ll give ya my birthday spanking!